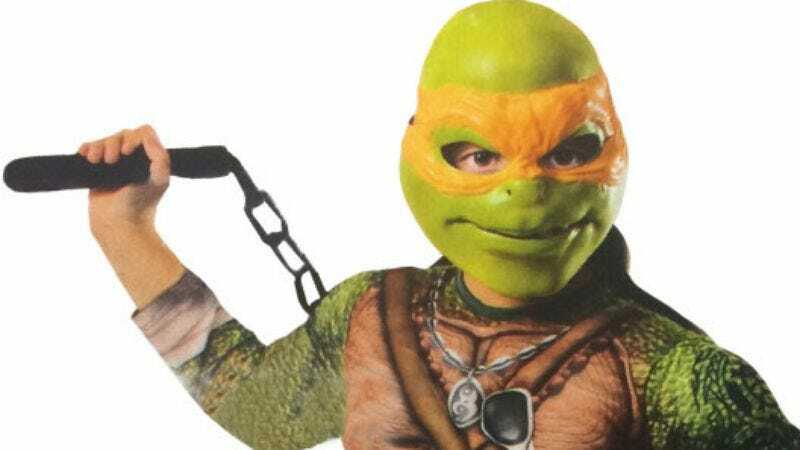 Is this is what Michael Bay's Teenage Mutant Ninja Turtles will look like, or just what we assume they'll look like? So far most of the images of the Michael Bay-produced Teenage Mutant Ninja Turtles have come from paparazzi on the set, such as these shots of the Turtle actors in their CGI-mapping suits, or—in the case of Megan Fox jumping on a trampoline—directly from Michael Bay’s brain. But while we await the release of more official photos or even a trailer to see exactly what Bay’s more plausible, not-necessarily-aliens, fully “authentic” Ninja Turtles will look like, we may already have some idea, thanks both to our most cynical assumptions and their physical manifestation, as this leaked Halloween costume. Provided the above photo has not already been removed by request (as it was on the TeenageMutantNinjaTurtles.com fansite where it was first posted), you’re looking at the new Michelangelo—whose “party dude” persona has finally been rendered more plausibly and more authentically with the addition of “party dude” accessories. For example: board shorts and hi-top sneakers; a tribal symbol necklace and tattoos, like those sported by other party dudes seemingly spawned from some mysterious ooze; super cool sunglasses, for blocking out the harsh rays of the sewer; what is either a loincloth or an equally impractical-for-a-turtle sweatshirt around his waist; and a face that evokes both Shrek and Jim Carrey in The Mask, as either would look after ingesting your own party dude accessories. Indeed, he is the world’s most fearsome fighting teen. Again, we have no way of knowing yet whether this is an accurate reflection of Michael Bay’s Teenage Mutant Ninja Turtles. But I think we can all agree this is an accurate reflection of everything we’ve imagined about Michael Bay’s Teenage Mutant Ninja Turtles.